The question we get asked most often is this: “Is image quality better when printing direct to fabric or when printing to transfer paper?” These days, image quality from one technique to the other is pretty consistent. While the color gamut is going to be a little wider on transfer, the saturation is going to be slightly better on direct, but the differences are negligible compared to what they were five years ago. As far as print speeds are concerned, they are more or less the same. The biggest difference between direct and transfer comes down to limitations in materials and applications. If your printer only prints direct to fabric, you can only print on direct-treated fabrics. The primary benefit to printing transfer is in its versatility of substrates and applications. If you’re printing to transfer paper, you have a wider range of applications on uncoated fabrics and rigid products. Pretty much anything that is dye-sub-able can be done on transfer. 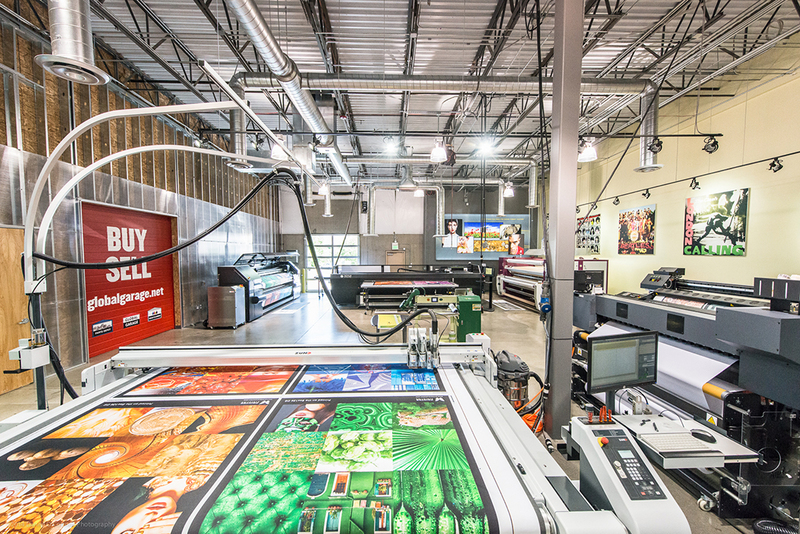 Even though stretchy fabrics like Power Stretch are available for direct-to-fabric printing, only two manufacturers that we know of have machines that can run them consistently, Durst and PrinterEvolution. The media handling system on these machines, specifically the feed and take-up mechanisms as shown below, were designed to be a little more versatile so they can handle a wider range of fabrics including some with stretch. Really, no machine can print directly to a full LYCRA® at the soft signage level. If you need those, they have to go transfer. Stretch fabric is fed through a D3200 textile printer (left) and the edges of an interior décor fabric is compared to soft signage fabric (right). When you start getting to interior décor, you are going to be doing transfer dye sub. Very few, if any, of the industrial fabrics or interior décor fabrics have any sort of direct coatings or treatments. Plus, many of these are textured and have rough cut edges. These rolls have a lot of fray on them versus the soft signage rolls which are cut and often heat-sealed, as shown above. Why are the rough edges a problem? Headstrikes. The rough edges can cause head strikes and the lint can get up into the printheads. Other fabrics, whether woven or knit, have a heat-knifed or heat-sealed edge. Even if you could buy home décor fabrics pretreated for direct printing, they would still have a rough edge and would require more finishing to get ready for printing, increasing production time and costs. Know your options, and know your business. While there are several machines out there that will only print direct or transfer, there are a select few that can do both. Consider what applications you want to do today and do your best to predict tomorrow, because these aren’t inexpensive machines. Consult with the experts in the industry, trusted vendors and trusted partners, that can help guide you. Talking to people who have been through it can really help you identify the best machine for your business.